Radio Times believes David Tennant is 'likely' to be in Broadchurch Series Two. A new Postman Pat: The Movie trailer has been posted to MSN. Also a graphic of David Tennant's character has been posted to Twitter. Tonight at 8.15pm, episode four of Broadchurch is shown on Austrian television station Puls 4. It is called 'Vorwürfe' (Accusations). A photo of blocking a Broadchurch scene with David Tennant and Euros Lyn has been posted to Twitter. Red Carpet News have posted a video of Chris Chibnall talking about Broadchurch Series 2 and another one of Olivia Colman saying some lovely things about David Tennant. Update on Gracepoint filming Monday 24th to Friday 28th March 2014. The link includes some photos of David Tennant. David Tennant is my Doctor T-shirt available. There are some lovely comments about David Tennant in a Times Colonist article about Gracepoint filming in Oak Bay. Doctor Who Figurine Collection Magazine issue 16 is published. It has a small photo of David Tennant on the cover. Broadchurch is one of the Best Streaming Series To Binge Watch This Weekend says ScreenJunkies. Digital Spy would like to see a prequel for Broadchurch. Broadchurch, Olivia Colman and Chris Chibnall all win Broadcasting Press Guild Awards. Unfortunately David Tennant did not win the Best Actor award. Digital Spy has Postman Pat The Movie teaser posters. The Essential Doctor Who Magazine issue one is published. This issue is about the Cybermen. Broadcasting Press Guild Awards are announced at a lunch today. Nominations include Broadchurch for Best Drama Series, David Tennant for Best Actor, Olivia Colman for Best Actress and Chris Chibnall for Best Writer. The full transcript of the David Tennant interview (with new photos) about Broadchurch and Gracepoint has now been posted to Worldscreen. RTC Forum have posted a fun David Tennant 2048 game. EntertainmentWise have posted a great review of episode two of W1A in general and David Tennant's narration in particular. Some great new photos of David Tennant filming Gracepoint on Monday evening have been posted to Tumblr. iPlayer link for episode 2 of W1A. The link is valid until 16th April but for the UK only. IF.com.au reports that The Politician's Husband is one of the programmes which will be shown on the new television station BBC First in Australia. Bridport News reports that people from the Broadchurch production team have been in the West Bay area which means that at least some of series Two will be filmed in the town. They also reiterate that filming is expected to last from the end of May until the end of September. Audio interview of Gracepoint fan Nathan Veenhof talking about watching filming. Kafka The Musical is cited in a Canada.com blog about BBC Radio's commitment to quality drama compared to that in Canada. W1A is one of Radio Times Top TV Picks For Today. Episode two of W1A premieres on BBC Two at 10pm tonight. A synopsis of episode two (with no spoilers). ScienceFiction.com have the details about the story for the Tenth Doctor Comic which will be published in July. There is a new David Tennant interview on Worldscreen about Broadchurch and Gracepoint. A great selection of photos (and details) from Gracepoint filming yesterday (including 2 of David Tennant) have been posted to WordPress. 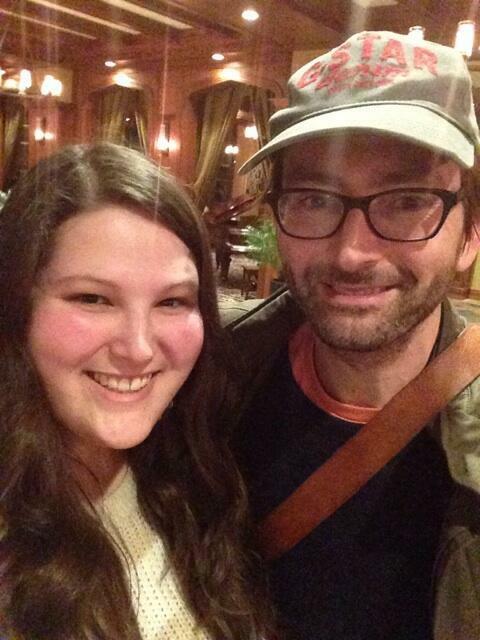 A lovely new photo of David Tennant with a fan at Gracepoint filming has been added to Tumblr. The RSC on Buzzfeed lists David Tennant in their 18 actors who started their career on stage. Photos of David Tennant with two fans have been posted to Facebook. 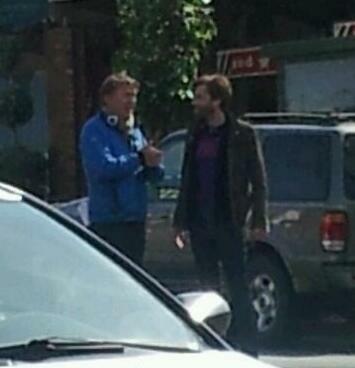 A photo of David Tennant with director James Strong on the set of Gracepoint yesterday has been posted to Twitter. Watch starts a new repeat of Series Two of Doctor Who today. Each episode will be shown at 8am and again at 4pm on Watch and on Watch HD at the same time. The episode is also repeated at 9am and 5pm on Watch + 1. The Escape Artist will premiere in the US on PBS Masterpiece on Sunday 15th June at 9pm. The Stage reports that Peaky Blinders and Broadchurch have picked up the most BAFTA Television Craft Award nominations. Broadchurch, The Day Of The Doctor and The Escape Artist are all nominated for various BAFTA Television Craft Awards. The winners will be announced on Sunday 27th April. The BBC have posted a behind-the-scenes picture of David Tennant filming his Sport Relief appeal film in Sierra Leone to Instagram. Update on Gracepoint filming Monday 17th to Friday 21st March (with links to photos of David Tennant). The opening scene of Richard II has been posted to YouTube. Sport Relief announced at the end of the programme that £51,242,186 was raised in just that evening. The Telegraph review of Sport Relief talks of David Tennant's outrage at infant death from preventable disease. A W1A mini episode was shown on Sport Relief with brief narration by David Tennant. 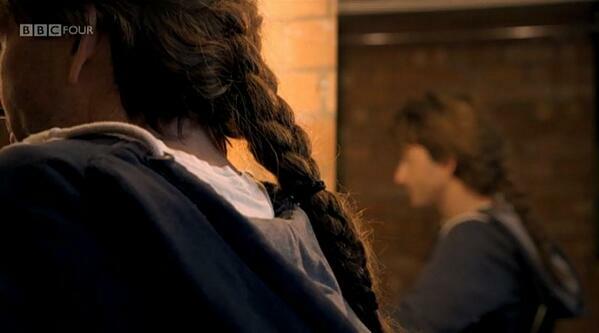 Another two David Tennant videos for Sport Relief were shown on the BBC. The videos were David with the children of Kissy Primary School showing how the money is spent and visiting Sierra Leone's Childrens Hospital again but this time with some good news. 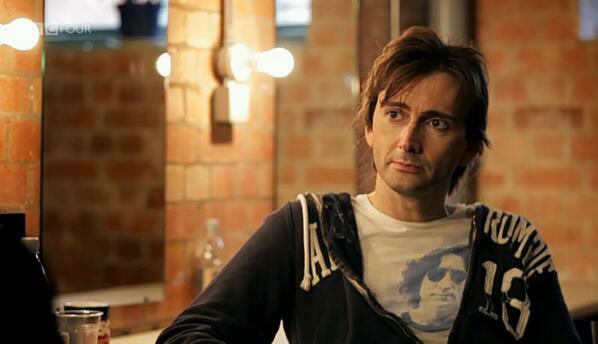 Two more David Tennant videos for Sport Relief were shown on the BBC. The videos were David Tennant seeing the devastating effects of pneumonia in Sierra Leone and visiting a family that live on a rubbish dump. An interesting article comparing Gracepoint filming with Broadchurch has been posted to TasteReport. 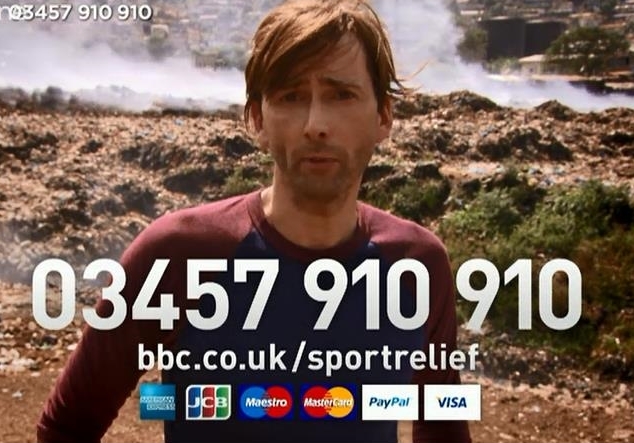 David Tennant's video for Sport Relief about children in a rubbish dump. Digital Spy includes Broadchurch in their 5 of TV's Greatest Whodunits list. Daily Express reports that David Tennant is one of the stars who sent a birthday card to a girl for her 18th birthday. Radio Times has posted David Tennant's Sport Relief Sierra Leone Diary online. A moving film from David Tennant will be shown tonight during Sport Relief. Victoria News has an article about filming Gracepoint in Sidney and the hint that there could be a second series if the first one is successful. The Minor Character will be broadcast on the Sky Arte channel in Italy on Friday 4th April at 10.45pm. Photos (including some new ones) of David Tennant in Look Back In Anger have been posted to Tumblr. Photos of David Tennant on the Gracepoint set appeared in Peninsula News Review. iPlayer link (UK only) for episode one of W1A. The link is valid for 7 days. The video interview of David Tennant recording and talking about Kinect Sports Rivals has been posted to YouTube, plus the company says some lovely things about David. Broadchurch will air in Italy from 28th April on the television station Giallo. The Richard II DVD and Blu-ray release date is Tuesday 6th May and available to pre-order from The RSC website. David Tennant's narration is 'the cherry on the cake' says Metro in its review of W1A. A photo of David Tennant with a fan yesterday has been posted to Twitter. W1A is one of Radio Times Top TV Picks for today (with its review). Episode one of W1A premieres on BBC Two at 10pm tonight. A synopsis of episode one of W1A (with no spoilers). At the RTS Awards tonight Broadchurch won the Drama Serial Award and Olivia Colman won the Actor - Female Award. Unfortunately Chris Chibnall did not win the Writer - Drama Award as the two writers from Run won that. Jodie Whittaker now tells BANG Showbiz that David Tennant will be in Series Two of Broadchurch, plus she talks about Gracepoint. Doctor Who website has posted a new set of behind-the-scenes photos from The Girl In The Fireplace. There is an article about Broadchurch on page 9 of the Mexican newspaper La Gualdra. David Tennant speaks about voicing Kinect Sports Rivals (with a new photo). The RTS Awards are announced tonight. Broadchurch, Olivia Colman, Chris Chibnall and Jodie Whittaker are nominated. The Escape Artist DVD is released today in Germany. The German title is Der Anwalt des Teufels. It is NOT confirmed but according to CultBox Jodie Whittaker has said that David Tennant will be in Series Two of Broadchurch. David Tennant has provided the voiceover for Kinect Sports Rivals. It will be released on Tuesday 8th April in North America, Australia and New Zealand and on Friday 11th April in Europe. Doctor Who The 2nd Series, Part 2 will be released on DVD in US on Tuesday 13th May. Tonight at 8.15pm episode two of Broadchurch is shown on Austrian television station Puls 4. The episode has been named Geheimnisse (Secrets). Update on Gracepoint filming Monday 10th to Friday 14th March 2014 (with photos). There is now a different address for requesting David Tennant's autograph. Each episode will be shown at 8am and again at 4pm on Watch and on Watch HD at the same time. The episode is also repeated at 9am and 5pm on Watch + 1. There will be a Broadchurch panel at Harrogate International Festival in July. The panel will consist of writer Chris Chibnall, Olivia Colman, Jodie Whittaker and novelist Erin Kelly who has written the Broadchurch official novel. A trailer for The Real History Of Science Fiction has been posted to YouTube. A lovely photo of David Tennant with a fan on the set of Gracepoint has been posted to Twitter. Germany shows all 3 episodes of Der Anwalt des Teufels (The Escape Artist) tonight from 8.15pm on the channel VOX. 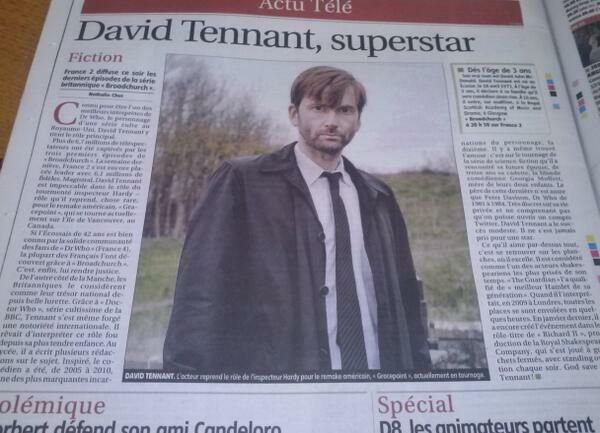 There is an article about David Tennant on the French website Télérama (translated version). SBS have posted the Australian trailer for The Escape Artist (which airs on Thursday). The trailer plays worldwide. Garden Re-Leaf's Gardening Quiz starts today with some questions by David Tennant. Gracepoint now has it's own dedicated section on the Fox website. The Broadchurch DVD and Blu-ray are released today in France. 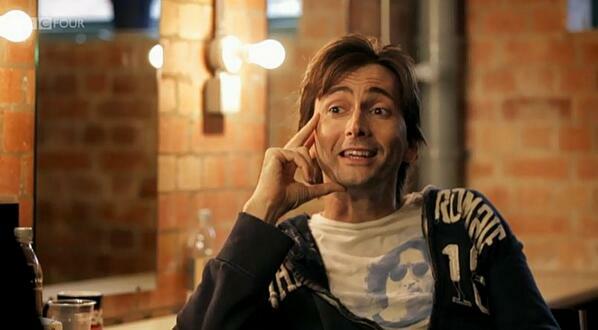 BlogtorWho has posted the interview with David Tennant from tonight's episode of How To Get Ahead. The BBC iplayer link for How To Get Ahead. The link is valid until 3rd April (UK only). Seriable.com have posted the official artwork and plot description for Gracepoint. The consolidated ratings for the whole of the first series of Broadchurch in France were that it received an average of 7.3 million viewers (including both live and replay) which gave it an overall audience share of 27.2%. Broadchurch beat both Luther and Silent Witness to win the Crime Programme of the Year Award and Doctor Who beat Call The Midwife and Downton Abbey to win the HD Drama Programme of the Year. Episode one of How To Get Ahead is on BBC Four tonight at 9pm. David Tennant is a contributor. The Independent looks at W1A with the first quotes from David Tennant's narration. Update on Gracepoint filming Saturday 1st to Sunday 9th March (including photos of David Tennant). Radio Times have published David Tennant's Sierra Leone Diary for Sport Relief. Two David Tennant / Tenth Doctor books are published today in the US from The Monster Collection. Michael Billington in The Guardian moans about the focus of the Olivier nominations (including the fact that David Tennant wasn't nominated). A photo of David Tennant and Anna Gunn on the set of Gracepoint last Friday has been posted to Twitter. A trailer (without David Tennant's narration) for W1A has been posted to YouTube. It plays worldwide. The first episode called Robots will air on Saturday 19th April on BBC America. An air date for the UK has not been announced yet. While it is unclear yet whether David will appear in every episode, he is listed for the third episode (Invasion) on Saturday 3rd May to discuss Doctor Who's villains the Daleks and the Cybermen. A photo of David Tennant (smiling!) on the set of Gracepoint on Friday has been posted to Twitter. Chris Chibnall won the award for Writer Drama, Factual Or Entertainment for Broadchurch at the Royal Television Society West Of England Awards it was announced at a ceremony in Bristol last night. The Escape Artist will air in Australia starting on Thursday 20th March at 9.35pm on the channel SBS One. Episode one of Broadchurch premieres in Austria on the station Puls4 at 8.15pm tonight. Episode 1 is called Entdeckungen (Discoveries). WOWOW has reported that it will broadcast The Escape Artist in Japan on 26th April. 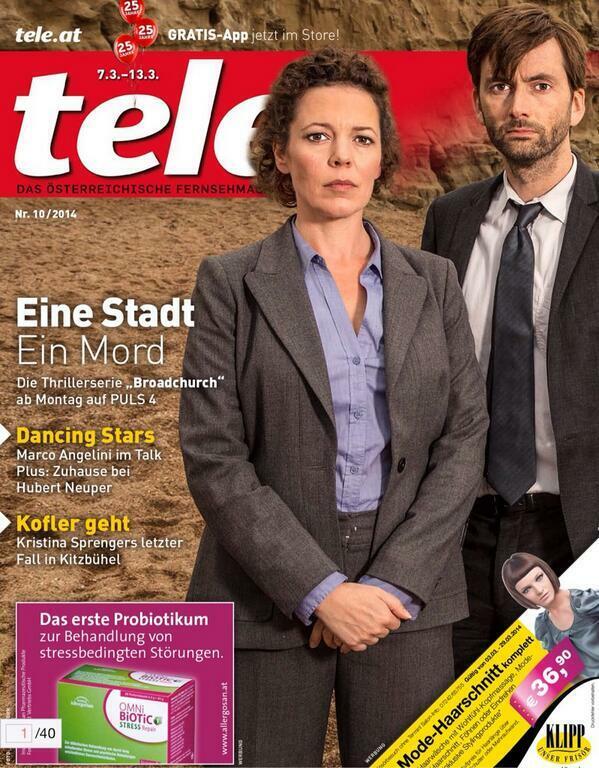 Austrian television listing magazine Tele has a photo of David Tennant and Olivia Colman on its front cover for #Broadchurch. A new photo of David Tennant filming Gracepoint on Thursday has been posted to Facebook. Unfortunately Pirates! In An Adventure With Scientists did not win the Best Long Form award at the British Animation Awards. It was won by Room On A Broom. David Tennant is mentioned several times in the Doctor Who 50th Anniversary Panel video from November. Metro includes David Tennant and Olivia Colman in Broadchurch in their Best TV Detective Duos Of All Time. Radio Times has a review of episode one of How To Get Ahead with a new photo of David Tennant. The British Animation Awards 2014 are announced tonight. The Pirates! In An Adventure With Scientists movie is a finalist. David Tennant's episodes of Star Wars: The Clone Wars is available on Netflix in the US and Canada from today. 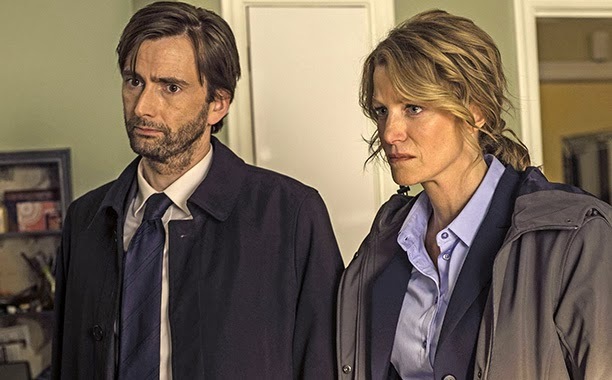 Entertainment Weekly have posted a new photo of David Tennant and Anna Gunn from Gracepoint in an article about pilot trends in telvision. Amazingly the french television channel France 2 is airing a clip thanking viewers for having watched Broadchurch. An italian article about Gracepoint and Broadchurch has a different Gracepoint logo photo (it shows Clover Point where some of the series is being filmed). Wednesday 19th March has been announced as the start date for W1A. 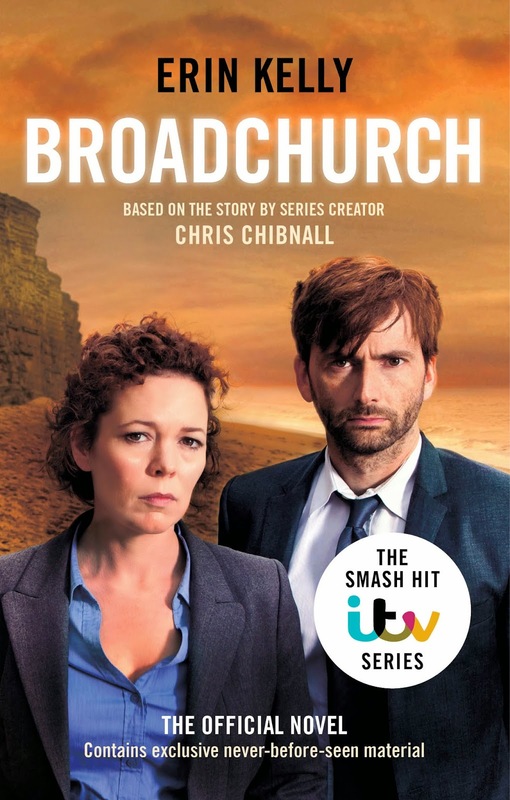 The cover of the Broadchurch novel has been posted online. Animation Magazine reports that the animated 6 minute long video '365' (including David Tennant's voice for 1 second) is now available to purchase. Doctor Who Magazine #471 is published today and is a Dalek special which includes look at The Fires of Pompeii. Two David Tennant / Tenth Doctor books are published today in the UK from The Monster Collection. Richard II cast (including David Tennant) are mentioned in a What's On Stage article about Shakespeare's most popular plays. The BBC have issued a press pack for the comedy W1A which David Tennant narrates (as he did for Twenty Twelve). For the first time ever in France Broadchurch has broken the million barrier on catch-up television. The channel is also using a different logo. The German trailer for Der Anwalt des Teufels (The Escape Artist) has been posted on Vox. It plays worldwide. Toutelatele.com compares the viewing figures of the first six episodes in France to the UK. C21Media has an article (in English) about the success of Broadchurch in France and its French remake. The Telegraph believes David Tennant may be nominated for a BAFTA for Broadchurch despite not receiving a nomination for the Royal Television Society Programme Awards. The awards will be presented at a ceremony on Tuesday 18th March at the Grosvenor House Hotel in London. Ozap reports that overall Broadchurch in France received 6.4 million viewers every Monday night which was 25.5% of the viewing public. For the third week, Broadchurch was the most watched programme in France last night with 6.50 million viewers (that is 23.8% of the audience watching television at that time). It was a year ago tonight that Broadchurch was first shown on ITV! BBC News reports that What We Did On Our Holiday was 2013's biggest shoot in Glasgow and it helped contribute to the £20 million raised last year by filming in Glasgow. The Local has an article in English about the success of Broadchurch in France also reports that it will be remade in French. Four writers and a director are already confirmed but no cast has been announced. French newspaper Le Figaro says 'Masterful, David Tennant is flawless in the role of tormented Inspector Hardy' in its article. Huffington Post BC has an article titled 'Gracepoint filming with David Tennant comes to Victoria' with photos of Friday's filming (mainly ones we have already posted). The final two episodes of Broadchurch are on France 2 tonight from 8.45pm. DoctorWhoTV have posted the second part of their detailed review of David Tennant's era of Doctor Who. The Swiss website I'llustre lists David Tennant in Gracepoint as one of the American TV series for the Sept'14 - Apr'15 season in the US. David Tennant is listed as one of the contributors to a new historical documentary called How To Get Ahead which starts on BBC Four on Wednesday 12th March at 9pm. 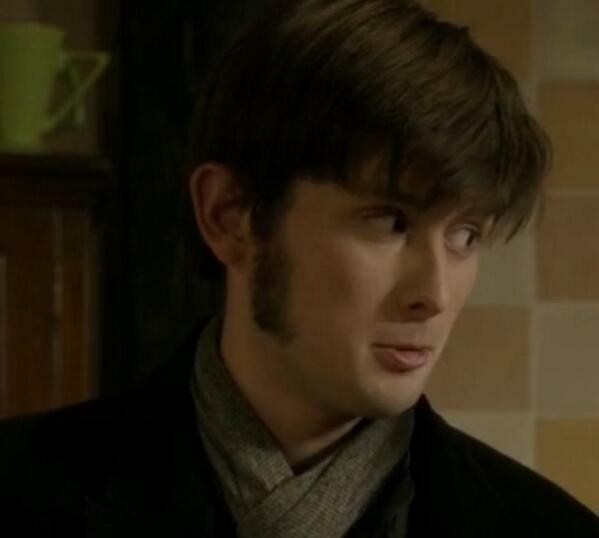 MSN reports that a David Tennant lookalike in Jonathan Creek last night 'caused a stir on Twitter.' A photo of the actor is here. A blog on WhatCulture thinks David Tennant is the actor most people didn't know was in Star Wars:The Clone Wars. An update on Gracepoint filming from Thursday 20th to Friday 28th February (episode three) including a photo of David Tennant filming last night.